On the evening of April 8, 2018, City of Fort Collins (CO) City Manager Darin Atteberry stood at a podium in a hotel ballroom. Addressing an audience of distinguished leaders of high-performing U.S. businesses, nonprofits and health care and education organizations, he shared a story about hanging a picture with his wife. In assessing his completed job, she had quipped, “That’s good enough for government work,” he said. Atteberry was at the April ceremony to officially accept the 2017 Baldrige Award on behalf of Fort Collins — a crowning achievement for his 22-year-long career in the city manager’s office and for a city that has already secured a long list of national distinctions on quality-of-life measures for its approximately 170,000 residents. For example, in 2014, it was named “America’s Most Satisfied City” by Time magazine based on Gallup survey results. The Baldrige Award is the nation’s highest and only presidential honor for U.S. organizations (across multiple sectors) that achieve excellence. Established more than 30 years ago, the award was named to memorialize the deceased U.S. Secretary of Commerce Malcolm Baldrige after he died in a rodeo accident during his cabinet-office tenure. Today, organizations that submit applications for the annual award process undergo a rigorous, three-phase evaluation against comprehensive criteria for performance excellence. Part of the Baldrige Excellence Framework, those award criteria were adapted for government organizations’ use more than a decade ago; since nonprofits organizations became eligible to apply for the related Baldrige Award in 2007, three cities have earned it, including Coral Springs, FL, and Irving, TX. City of Fort Collins is the third. The morning after the recent Baldrige Award ceremony, Atteberry delivered a presentation on his city’s leadership practices to many of the same audience members. The event was part of an annual conference where Baldrige Award recipient organizations present their best practices in seven key areas to advance the learning of other organizations’ leaders. Framing a leadership philosophy through the leadership system model. Atteberry further explained that his government has structured all its strategic planning (short- and long-term), budgeting, measurement and reviews and work system planning around seven key outcome areas: Neighborhood Livability and Social Health; Culture and Recreation; Economic Health; Environmental Health; Safe Community; Transportation; and High-Performing Government. These strategic outcome areas were co-created with citizens, business representatives and city staff members during the implementation of the first BFO cycle in 2005. And the concept allows a focus on civic issues that are important to the community, he said, as well as allowing increased collaboration among workers across the city’s service areas. 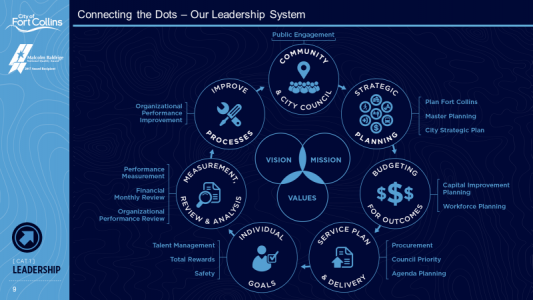 The city’s leadership system incorporates its strategy, culture and results. In describing it, Atteberry pointed out that (1) it is a continuous process; (2) it surrounds the city’s mission, vision, and values. (“Our first model was top down, more hierarchical; this one is a continuous flow,” he said. ); (3) it incorporates key processes — those processes that are systematic and touch each service area. … and (4) it is easy to explain to citizens, board members and the city’s staff.